The 70th Fighter Squadron played an important part in air operations in the Asiatic-Pacific Theater during World War II. Activating on 1 January 1941, the unit completed its training and on 5 December of that year it set sail for the Philippines. After two days at sea, a message arrived with news of the Japanese attack on Pearl Harbor. The unit then returned to Hamilton Field, California, where it remained until departing for the Fiji Islands on 12 January 1942. Then designated the 70th Pursuit Squadron (Interceptor), the unit arrived in Fiji on 29 January 1942 and began operations at the end of February. It initially used P-39s as fighters and dive bombers. Following its redesignation to the 70th Fighter Squadron on 15 May 1942, the 70th flew a wide variety of combat missions, including many with Naval and Marine air units. In October 1942 the 70th was assigned to the 347th Fighter Group. On 21 December, the unit entered the battle for Guadalcanal, which continued into April of 1943. The 70th flew missions out of Guadalcanal until October 1942, when it transferred to New George to continue the fight. Through 1943 it employed P-39s, P-40s, and some P-38s in carrying out fighter and ground attack operations against Japanese bases, aircraft, and shipping in the vicinity of Rabaul, Torokina, Bougainville, and other key enemy locations in the Bismark Archipelago. Throughout World War II, the 70th Fighter Squadron distinguished itself in combat from the Solomon Islands to China, participating in most of the campaigns fought in the South and Southwest Pacific and in the Philippines. One of the highlights of the unit’s history during World War II was Captain Thomas Lanphier’s 18 April 1943 "kill" Japanese Admiral Isoroku Yamamoto, the man behind the attack on Pearl Harbor. The 70th inactivated 26 December 1945 and remained dormant for 30 years. On 8 September 1975, the unit was redesignated the 70th Tactical Fighter Squadron and reactivated 30 September 1975 at Moody Air Force Base, Georgia, flying the F-4E Phantom II. In the F-4, the 70th was the first to go on a full deployment to Nellis Air Force Base, Nevada, in late November 1976 as the primary unit in "Red Flag 77-2". The "White Knights" worldwide commitment took them to Cairo West Air Base, Egypt, from June to October 1980 to take part in Proud Phantom. The unit was part of the first United States military forces in that region since World War II. The unit again deployed to Egypt in August 1985 for Bright Star. In total, the unit participated in some 13 major exercises including Green and Red Flags at Nellis, Gallant Eagle exercises in September 1984 and 1985 at George Air Force Base, Border Star in March 1985 at Holloman Air Force Base, Constant Peg at Nellis, and Maple Flag exercises at Canadian Forces Base Cold Lake in May 1980 and September 1986. In the 12 years of 70th F-4E history, the Phantom flew an impressive 54,045 total sorties. An all-time Tactical Air Command record during peacetime was recorded in April of 1987, when the 70th flew 760 sorties that month. More than 600 F-4E crew members have worn the checkered blue and white scarf of the White Knights and amazingly accumulated more than 48,000 accident-free flying hours since April 1981. Ever ready for national defense, the 70th rose to the top of America’s fighter squadrons as winner of Long Rifle II before their transition out of the F-4E. On 1 October 1987, the 70th Tactical Fighter Squadron began its conversion to the F-16A/B Fighting Falcon. The squadron became mission capable by 1 April 1988. Only two years later, the 347th Tactical Fighter Wing and its three fighter squadrons began transitioning into the F-16C/D. Over the next few years, the 70th participated in several deployments and exercises with its F-16s and dedicated personnel. They competed and performed well in several Red Flags, Air Warriors, and Low Country Bombing Derbies. On 1 November 1991, the 347th Tactical Fighter Wing and its flying units lost their "Tactical" designations, and the 70th became the 70th Fighter Squadron. Less than two years later, on 25 June 1993, the 70th stood down and lost all aircraft, personnel, and equipment assigned. It remained active for lineage and honors purposes until it stood back up on 24 March 1995, when the wing held a ceremony to officially assigned incoming A/OA-10 Thunderbolt aircraft to the 70th. The 70th received its first planes on 8 June 1995, when eight A/OA-10 aircraft arrived from Davis-Monthan Air Force Base. Throughout the next years the unit made several rotations to Southwest Asia and in particular in the continuing struggle against Saddam Hussein’s weapons of mass destruction capabilities. On 1 May 1996, Air Combat Command chose the 70th as the East Coast A-10 Demonstration Team. In addition, the squadron participated in support of numerous exercises and operations, including Air Warrior I and II, Operation SOUTHERN WATCH, and Operation DESERT THUNDER. From 1996-2000, the 70th FS deployed four times to Kuwait in support of Operation SOUTHERN WATCH, participated in ten Air Warrior exercises, and supported six fighter weapons courses. This in addition to numerous local exercises, Red Flags, and various joint exercises around the world. In early 1999 the 70th Fighter Squadron received notice that it was to prepare to inactivate. Although still tasked to support various contingencies and exercises, the squadron began drawing down its aircraft, equipment, and personnel throughout 1999 and the first half of the new millennium. The last two A-10 aircraft (tail numbers 80-0171 and 80-0276) departed Moody on 9 June 2000 for Davis-Monthan Air Force Base, Arizona, where most of the 70th’s aircraft had been transferred. 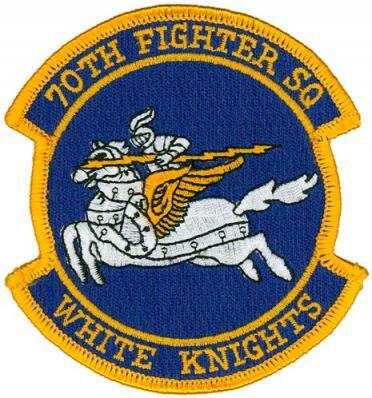 Effective 30 June 2000, the 70th Fighter Squadron "White Knights" inactivated at Moody Air Force Base.